Red Sable Marking brushes are made by inserting fine quality red sable fill into a wood handle with a rustproof, seamless ferrule. 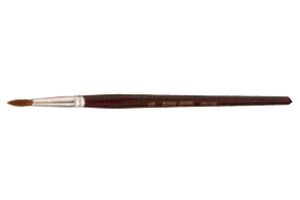 Red sable is the preferred hair used in artist brushes, as it has unique properties that allow it to come to a fine point and retain elasticity. There are nine standard brush offerings available with various diameters, trim lengths and 7.5" overall lengths to meet the needs of various industries and applications. These brushes come in a pack of 12 units. Depending on the size and style, Red Sable Marking brushes can be used for many different paint and liquid applying tasks as well as general cleaning applications. The smaller diameter offerings are ideal for watercolors, lettering applications and ultra fine touch-ups.